Well done to "the northerners" who won £72.00 on Play your cards right, last night! Submitted by Hayle Harbour a... on Wed, 20/04/2016 - 00:00. If you are interested in trading or performing at our event please do not hesitate to contact us! From 2:45pm onwards - The Sandy Acre 7, Black Friday, The Mosquitoes, Flycatcher Funk and Slapdash Trio! It's lining up to be a fantastic day, all that's left to confirm is some beautiful Cornish sunshine! Our applications for stalls are coming in thick and fast! Lots of tasty treats and beautiful crafts to be had! Get yours in quick to guarantee a space! Below are just a few in our long list who are confirmed. Band line up to be announced soon! Naked Sheep, National Coast Watch St Ives, Cats and Cartwheels, Cornwall Swing Boats, Bangers on the Go, Big Pan Parties, The Brownie Baker, Cornish Edible Insects, Cornish Fusion Fish, Cornish Meadow Preserves, Cornwall Wildlife Trust, Cornish Sea Salt, Food Box Farm, Kernow Inferno, Hayle Fishermen’s Association, Spudolicious! Submitted by Fireworks for H... on Wed, 05/10/2016 - 13:15. Fireworks for Hayle Foundry Day 10th Celebrations by Sonic Fireworks from Sonic Fireworks on Vimeo. Submitted by Lauren Bambury ... on Fri, 02/09/2016 - 12:16. 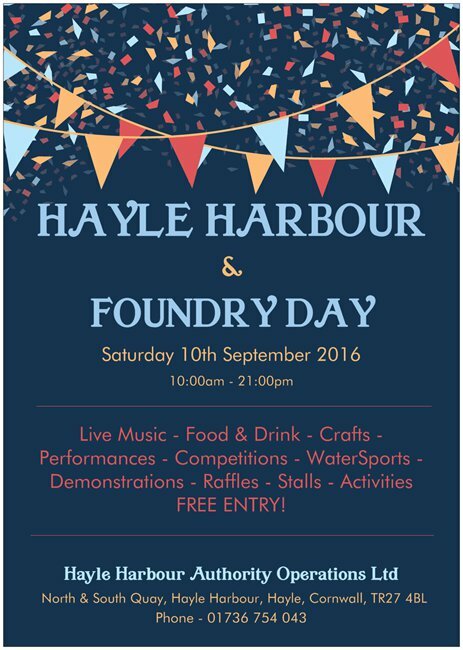 On 10th September 2016 a special event will be taking place on North and South Quay of Hayle Harbour. This year’s event will feature musical entertainment, food and drink and a fireworks display! Due to your close proximity to the event, the Hayle Harbour and Foundry Day Organising Committee would like to make you aware of the event itself, and let you know that approval was granted by Cornwall Council and Hayle Town Council to allow this event to take place. In order to provide the necessary safety zone for the presentation of fireworks at our event there will be no public access to the Middle Weir between 5pm and 10pm on Saturday 10th September 2016. It is with your safety in mind that we must restrict all access to this area and we apologise in advance if this causes any inconvenience. The firework display will take place at 9:35pm and will last for approximately 6 minutes. Entertainment and Activities will take place on 10th September from 10:00am until 21:30pm. Music will be presented from the Main Stage which will be situated on South Quay, local choirs and singing groups will have 30 minute slots with 10 minute breaks in between performances these performances will last from 10:00am until 14:00pm. Larger bands will then be performing in 1hr30min intervals with a 15 minute break between performances; these are due to last between the hours of 14:30pm and 21:30pm. There will be free parking provided on East Quay, Harveys Towans and areas of North Quay and £1 All Day parking opposite the ASDA superstore during event operating hours. 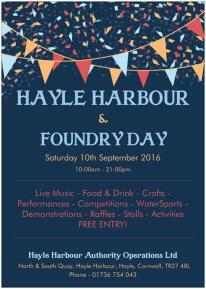 The Hayle Harbour and Foundry Day organising committee would like to make you aware of this event and invite you to this community celebration! Again, we hope that these activities do not inconvenience you in any way. If you require any further information please call us on 01736 754 043 or for general information please visit the Hayle Harbour Authority Office, North Quay.